Born Learning Trails are designed to help parents, caregivers and communities support early learning by helping boost children’s language and literacy skills – and encouraging families to get active. They are a great way to elevate awareness of early childhood education, encourage outdoor play and promote active learning in nature. Born Learning Trails include 10 fun, activity-based learning stations. We have installed permanent trails in Cottonwood, Currie, Fulda, Granite Falls, Hendricks, Lake Wilson, Walnut Grove, Balaton and Dawson. A bi-lingual trail will be installed in Marshall in 2019. We also have a portable version of the Trail which can be used at both indoor and outdoor events throughout the year. 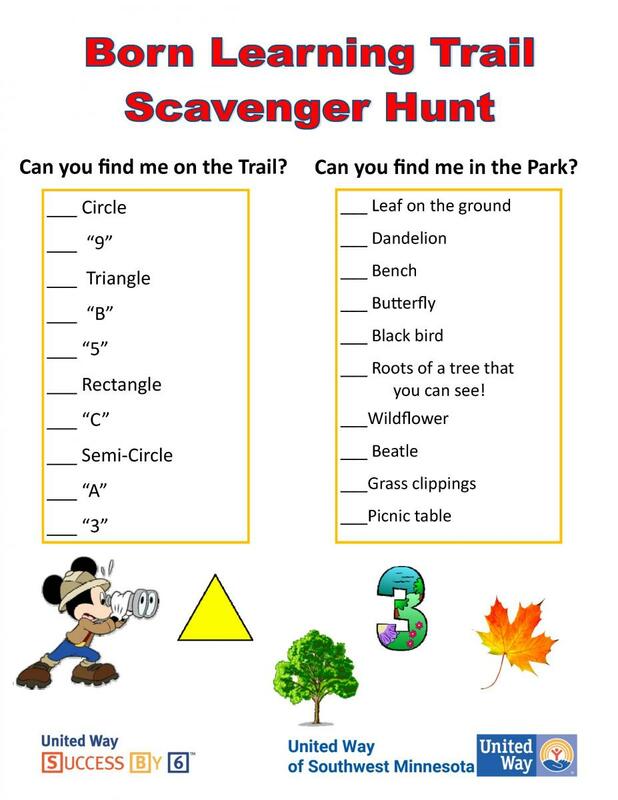 The following are some activities you can use when on the trails to enhance the learning experience.